In fact, I’m allergic to alcohol. I break out in spots: New York, Philadephia, Washington, DC. 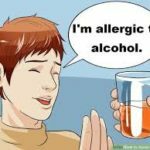 “Allergic to Alcohol” picks up after I graduate from college, the point in my life where I escaped death a number of times. I reveal three scenarios where I “came to” in ill-advised locations with perfect strangers. Throughout the two and a half year’s post-graduation, my alcoholism went from problematic to early dependency. Blackouts were the norm, and I was powerless over my behavior. My judgment was drastically impaired, as evidenced by my third and final arrest—for driving under the influence—because I stubbornly refused to let my friend take the wheel. This chapter ends with a terrifying night when, on the precipice of Hell’s door, I felt the grace of God give me the strength and courage to survive. Sign up for Go Within Yoga’s “More Than Just Yoga” monthly newsletter and receive a 20% Discount!